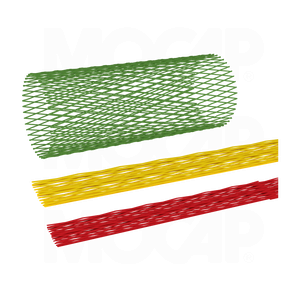 MOCAP LDPE Plastic Netting is ideal for product protection and separation of products in all process, handling, shipping and storage applications. The diamond shape open mesh eliminates trapping of moisture, thus protecting against rust and corrosion. Protective plastic netting is flexible enough to stretch over irregular shapes and is stocked in a wide range of sizes. MOCAP plastic netting delivers superior conforming protection for all of your shipping and handling needs. Custom size and cut-to-length plastic netting is also available - contact MOCAP for more details. MOCAP stocks Protective Netting in many sizes for immediate shipment.